PLEASE READ! This is an important reminder for all students using a “new” Vital Source e-book this term. In week 3 of the term (this week), you must click on the Vital Source e-book link within your class’s Canvas shell. Once you click the e-book link from within Canvas, you will have access to the book for four years. Please allow a few minutes for the renewal to sync with the Vital Source Bookshelf app on your mobile devices. 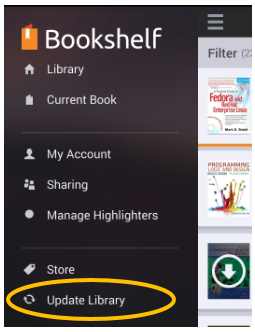 If the e-book renewal does not automatically sync with the Bookshelf app, click on the “Update Library” option from the app’s main menu (see image below).